Confused with all the bird species? You need help choosing a pet bird? Let's consider a few factors when deciding on the best pet birds for you. There are many types of pet birds you can choose from. Some are small, some large, some quiet, some very loud, some cheap and some very expensive to buy and maintain. Some birds, like budgie parakeets, live about 8 to 10 years. There are known cases that some lived much longer, 15 even 22 years. Other birds, like large parrots can live 50 years. Finches and canaries life span is about 15 years. So you need to decide how long do you want to commit to a pet bird since it is one of the most important factors when choosing a pet bird. Easy thing to remember is that the larger the bird is, the longer it should live. A lot of things depend on the size of the bird. You will need to consider how much space do you have to accommodate the bird. Maintaining a larger pet bird will cost more. It eats more, you need a bigger cage which is more expensive, etc. For bigger birds, you also need big stands where they can spend time during a day while a parakeet can be satisfied with a small playpen. Small and medium playpens and activity centers are not very expensive. Let us not talk about the cage, food and accessories but see how much the bird itself can cost us. In today's economic situation this is an important issue while we are choosing a pet bird. A budgie parakeet is often considered the cheapest and as some say "throwaway" pet. Mostly because they are cheap. You can find them priced from 10 to 20 US dollars for pet birds and about 50 for show birds. In UK they cost from 5 to 20, even 30 UK pounds for a show bird. In Serbia, where I come from, a budgie costs from 8 to 15 euros for a pet bird and 50 euros for a show bird. 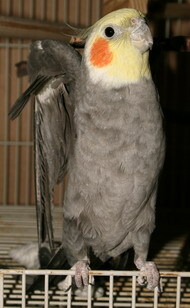 Cockatiels are anywhere from 50 to 300 US dollars and other types of pet birds can be bought for 600, 900, even 30.000 US dollars. These large, expensive parrots will cost a lot to maintain so you can spend more than 100 US dollars a month just to feed them. Other pet birds can be less expensive. You can find finches for about 15 to 35 US dollars. Canary birds also have different prices, in UK they are 15 to 20 pounds, in USA you can pay even 350 US dollars for a bird, while in Serbia you can get a pet canary bird for about 20 euros. One more financial issue that effects choosing a pet bird. Larger birds need larger cages and they are more expensive. Their toys are also bigger and therefore more expensive. So basically, if you are getting a larger bird, not only will you pay more for it, but you will pay more for everything the bird needs. While we are talking about prices, let's cover this aspect of having a pet. People sometimes forget that pet costs money all the time, not only when getting one. Maintaining a pet will include vet expenses, food and sweets, toys. Now, if you are anything like me (if you are a female I am sure we are alike and you have some compulsive shopping habits) this upkeep will cost even more. It costs me more always. I am completely compulsive shopper when it comes to pets. I can not pass a pet shop without getting inside. I always have at least two or three bags/boxes of different kinds of foods for any of my pets. I buy them toys and then throw away the old ones. But the old ones are never really old and ready to be thrown away. So count this in if you just have to buy something for the pet every time you see it. Some birds ask for more company that others. If you want to socialize a lot with your bird than you should choose a parakeet or any parrot. They are very friendly and easy to tame. You want to socialize with the bird but you will not spend a lot of time at home? Then get a pair of these pet birds. Are you choosing a pet bird you don't want to socialize too much with? You just want to have them around? The best pet birds then would be a pair of finches or canaries. They are pretty, they sing nice but they don't need you to play with them. Choosing a pet bird also depends a lot on the amount of commitment you can give to your pet bird. This is connected with the previous one because, like socialization, it depends on the time you are willing to put aside for your pets. Some birds ask for more commitment. I am talking about the time needed to provide basic things birds need to be happy. How much time you need to feed them, to clean them and train them. Again, smaller birds are easier to clean but the bigger ones are considered smarter therefore easier to train. Still, a big bird wants much more attention than the small one. Every bird specie has different personality and every single bird has a different one, too. Some birds are friendlier, they like cuddling. A good example are love birds, if you get a single one, you will have to replace its soul mate and cuddle it all the time. Budgies are very talkative, they like being loud, they are all over the place. Some big pet birds are calmer but require a lot of attention. Well, this is an important one. A factor you should never neglect. Especially if you have neighbors. If you live in a family house and don't have any nagging family members this might not be that important. But if you live in an apartment building, this might be issue number one when choosing a pet bird. Parrots, parakeets, cockatoos, they all make some noise. Sometimes a lot of it. My budgie parakeet wakes me up every morning. He just won't be quiet. Imagine a bigger bird. It is not only a question of a bird waking you up, the problem could be that they will probably bother your neighbors. When you are choosing a pet bird, you need to take in consideration the world around you and the bird. So if you think the best pet bird for you is one of those, make sure your neighbors don't mind. The opposite to these loud birds are birds that sing nice. Those would be finches and canaries. Some birds make more some make less mess. You need to clean them often since they excrete often. Some things to consider while thinking of the best bird as pet is that they tend to make a mess with seeds and feathers. I made a mistake once and put my budgie's cage on top of the shelf where I kept my stuffed toys. They were a mess very fast because of the seeds and feathers that kept falling on them all the time. So think well where will you put the cage to make it easier on you. Depending on the pet bird you choose, you could have some problems providing a good diet for it. For example, a lorikeet needs to be fed with nectar while other birds like budgie or a cockatiel eat seeds. How much time you have to dedicate to creating your bird's diet? As you know some birds can learn to talk or do tricks. When people see a budgie parakeet they never think that this pet bird can learn more than a couple of words. But he can. A male can learn several hundreds words while a female will learn up to a hundred. Cockatiels on the other hand, are not that good talkers. They do whistle good, though. They can learn to whistle a whole song very easy. While budgerigar is imitating your words and not really understanding anything bigger parrots can learn to say Good morning in the morning and in the evening they will say Good evening. I saw one like this, trust me. It is scary how smart some of them are. 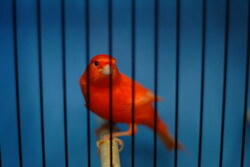 Of course, little singers like canaries will not talk but they will sing beautifully. Just make sure you get a male canary because females don't really sing a lot. Most pet birds can learn tricks, of course I don't mean canaries and finches, but parakeets, parrots and other birds of the same family. As any animal, the best way to stimulate learning is giving them little treats and letting your pet sleep enough. Some people will not mind paying a lot of money to get a rare parrot. 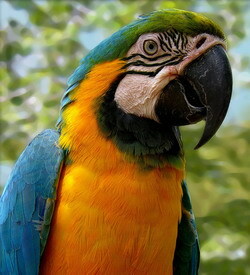 Those parrots are usually taken from the nature and smuggled into a country just to be sold as pet birds. Wild animals as pets are not a good idea. If you get a wild bird it could carry some diseases. Also it can not be tamed as a hand fed bird can. It is harder to socialize it. Put aside problems you could have with it and think of the bird's problems. If you can not provide conditions very similar to what it had in the wild, you will just make it unhappy. These are the most important factors to consider when choosing a pet bird. The best bird as pet is the one you choose and love, no matter what specie it is. The best pet bird is the one you call your friend because he is so happy when he hears you unlocking your door, coming back from work.